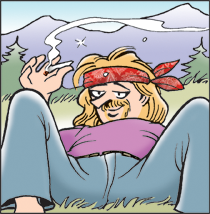 These tantalizing memory bites will give you a taste of the vast Doonesbury story archive. For the full narrative feast, go to GoComics.com. You'll have access to every Doonesbury strip ever published. Plus you can peruse over 400 other comic strips and editorial cartoons, and receive all your favorites in one daily customized e-mail.